This is stunning and the polkas are such a fun addition. glad your home is all safe and sound - we are expecting 5-8" here early next week - wonderful coloring on the card - love the polka dot background - perfect for the plant. So glad to hear that you are alright! This is one uber cool succulent and the polka background is TDF! Had to pin it! ps forgot to add that I made a card yesterday with black polkas in the background too.... but mine are just 'slightly' bigger, aren't they so much fun and to me they will never be out of fashion. Your coloring on this card is amazing Joan! It looks like you could reach out and touch it. Just gorgeous! 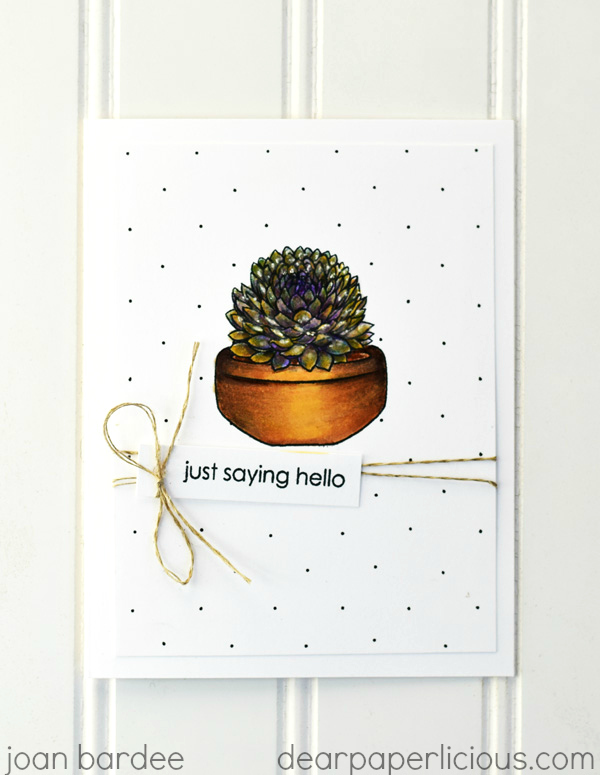 What a wonderful card, I think succulents are hard to do...but yours is wonderful! I also love the technique for the dots you used from Julie, must remember that! Also glad to hear that the damage to your home ended up being more minor than thought, hope all is well now. I wondered about you and the snow storm. Glad it was only minor damage, but that's bad enough. Really love this card in all its stunning simplicity, Joan.